So this week I signed up for a 5 Day Cleanse with a lot of my Young Living friends. I thought, "No big deal. I've done cleanses tons of times!" Somehow I didn't notice that, when they said Cleanse, they meant NO EATING for 5 days! Oops! Should have read the fine print!!! But still I thought it couldn't be that bad. I ordered my 5 Day Nutritive Cleanse as part of my Essential Rewards order this month, got my kit and instructions in the mail, and started alongside all my friends on Monday. FULL DISCLOSURE: You are allowed three small snacks during the day (you pick from a list of fruits, veggies, and raw nuts) but your "meals" are shakes made from the Balance Complete + water or non-dairy milk. With your "meal" you drink 2-4 oz of Ningxia Red (super yummy nutrient-rich drink). Taking a break from solid foods allows your digestive system some rest so that your body can expend its effort on detox rather than on digesting your meals. Don't worry about calories or feeling hungry though. There is plenty of protein in the Balance Complete to keep you feeling full-ish throughout the day. So how did it go for me? Besides sleepiness, I just felt groggy, with a dull headache and brain fog. By the time I went to bed that night I had a really bad headache that kept me from sleeping well. But on the bright side, I wasn't hungry at all, and I only have one serving of blueberries as a snack the whole day! Click here to watch my workshop on the importance of Emotional Detox. I'm still feeling crappy. Less brain fog but more headache. And the strangest part is that I feel aggravated. Like all the little things that usually wouldn't bother me are now "nails on chalkboard" level ANNOYING. The feeling isn't strong, and I'm aware that it's not part of "me." In other words, I don't associate with the feelings, but they are there anyway, firing in my brain. 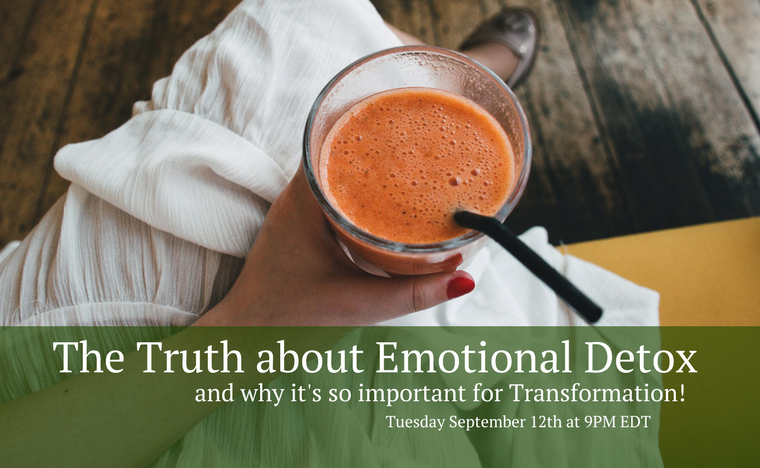 I find this fascinating, as I truly believe that emotional and physical health are linked and that a physical detox will cause emotional detox at the same time. Still not hungry, which is great. Just planning to eat my small snacks anyway so that I have energy for my LIVE workshop tonight. Still not feeling very energetic, but my mind is clearer and no headache! Slept in this morning. Also still feeling the toxins coursing through my blood veins (think about that feeling after a late night out). My energy increased a bit after "lunch." I also had an apple as one of my snacks, hoping that would move along my digestive "process" ;) No such luck. Today has been so much easier. No headache and much less sleepy. My skin also seems brighter and smoother. Yay! I am hungry though, so I've had all the snacks for the first time. I switched to drinking from cold to hot water, with a few drops of Citrus Fresh vitality and Thieves or Cinnamon Bark Vitality since it's chilly today. I can feel my digestive system rumbling more, but still not much to report in the bathroom department ;) I have this same constipation at the beginning of all cleanses (quite the opposite from what most people experience), but it seems weird that this one is almost over rather than just beginning, like my month long cleanse would be. Overall at nearly 11:30 at night I am bussing with energy and getting more work done that in the past couple of days combined! Yay! Finally feeling back on track! Feeling great this morning again. Clear head without any caffeine (not that I'm not looking forward to my morning coffee tomorrow ;) ) Started out instead with some hot water with a few drops of Peppermint Vitality. That helped get my digestion moving better than the past 4 days. Looking forward to a long, productive day! So this is the first time I've ever done a cleanse where both the type and AMOUNT of food was restricted (vs. just the type of food) and I told y'all I was nervous. The first 2.5 days were pretty awful. My headache and fatigue felt worse than the 30 days cleanses I'm used to. But now on Day 5 I can tell it was totally worth it. All the detox was crammed into 5 days so now I have 25 days of just living normal life and enjoying the benefits! Day 4 was where I really started to feel great. By the end of the night I had accomplished massive amounts of work and still had energy left over. I even got to several boring projects I had been putting off for a while. And today (Day 5) I can tell I'm going to be really productive again. So overall, even though I was at a very limited capacity for 2 days, I am actually accomplishing the same amount of work (if not more!!) for the whole week! The other bonus is that I haven't felt tempted by any "normal foods," even while shopping for my blueberries and apples at the grocery store. I AM excited about drinking a little coffee tomorrow, since it helps with regularity. But other than that I think I'll keep eating clean and healthy as long as I can to continue the benefits of the cleanse. **Have any questions about this cleanse? Let me know in the comments below, and I'll answer you based on my own experience or by checking in with the other ladies to see how their experiences can best answer your questions. Let me know if you need to set up an account with Young Living, and I'll help get you started! I definitely recommend this product after seeing the results, and I've got lots of other digestive support products, as well, that we could chat about!